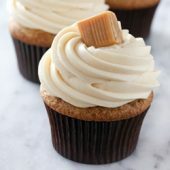 Moist homemade cinnamon apple butter cupcakes topped off with caramel cream cheese frosting. A fun seasonal dessert! Preheat oven to 350°F. Prepare a cupcake pan with 7 paper liners. In a large bowl or stand mixer, cream together butter and sugars until light and fluffy. Mix in egg and vanilla, scraping the bowl as needed. Mix in cinnamon, baking soda, baking powder and salt, followed by flour. Mix until smooth and well combined. Finally, mix in apple butter, mixing until fully combined and no streaks remain. Use a large cookie scoop to divide the batter equally between 7 liners, roughly 3/4 full. Bake for 20-22 minutes or until a toothpick inserted comes out clean. Cool in pan for 2-3 minutes, then transfer to a wire rack to cool completely. In a large bowl or stand mixer, beat cream cheese for 30 seconds before adding butter. Beat together until light and fluffy. Add vanilla, followed by 1 cup of powdered sugar at a time until fully incorporated. Add 1 tablespoon of caramel sauce at a time, beating well between additions. Transfer frosting to a large piping bag fit with desired piping tip*. Pipe frosting onto cooled cupcakes. Top off with caramel squares. *Thick caramel sauce should be used, not caramel dessert syrup topping. *A jumbo open star piping tip was used for this recipe.